NARRATIVE: The Spokane City Fire Dept. dispatched fire apparatus and fire fighting crews to 3724 N Cook at 2:15 in the afternoon of Thursday, Aug 13th, for a reported structure fire. Assistant Fire Chief Brian Schaeffer was first on the scene and reported heavy black smoke issuing from a ground floor apartment in a 2 story wood/frame multi- building apartment complex. Under the direction of Chief Schaeffer the arriving crews of fire fighters were given assignments that, when carried out, led to a rapid extinguishment of this fire and their aggressive tactics kept the fire contained to the room of origin. All tenants of this particular building in the complex had successfully exited their apartments before fire fighters arrived on scene. As always the fire fighters did a thorough search of the entire building to insure that everyone was safely outside. There were no reports of any injuries to the fire fighters at the scene or to any of the escaping civilians. The fire damage was confined to the apartment of origin with the majority of the fire damage contained to the room of origin. Smoke damage was also contained to the apartment of origin because the fire fighters were able to get to the seat of the fire very quickly. The involved apartment will be untenable until repairs can be made and it was learned that the displaced tenant will be staying with friends until such time as the apartment can be repaired. 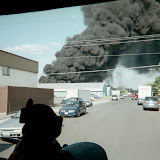 A cause for this fire is still being investigated by the Spokane Fire Dept. 's Special Investigation Unit. DAMAGE EXTENT: Heavy fire damage to one room that was being used as an office, smoke damage to most of the remainder of the apartment along with some minor water damage. Don't forget to vote on how you feel about the proposed insurance plan. The meeting on Tuesday answered a lot of questions (including what happens if this doesn't pass). If you weren't able to go to that meeting or the one today, ask around. A lot of people were there and can answer your questions. Plus, all the worksheets and documents were mailed out to everybody who has registered on the local 29 account. The union has some hard copies too. If you forgot your user name or password (like me) to vote, it can be emailed to your account through the local's website. Find out what the facts are, think it over, and vote as soon as you can! You have until 08/19/2009 08:00:00.